They can seem opposites. Antonio Conte is the manager who won the Premier League this month. Arsene Wenger has not won it for 13 years. But if the present belongs to the Italian, the historic distinctions rest with the Frenchman. Wenger has won the FA Cup six times. Lift it on a seventh occasion at Wembley today and he will be the outright record holder, displacing George Ramsay, the Scot Aston Villa appointed in 1884. In contrast, while Conte is a serial winner of leagues, he never claimed the Coppa Italia as a coach. As Wenger looks for a familiar achievement, Conte seeks a first. As west and north London, red and blue, meet, it is with acute distinctions. Yet they are interlinked. Chelsea's season was transformed by September's 3-0 defeat by Arsenal, which Conte used to usher in his 3-4-2-1 system. Arsenal's was revived when Wenger copied Conte. He has won eight of nine games with a new shape. His problem is that it is dependent on centre-backs and Arsenal are short of them, with Laurent Koscielny banned and Gabriel Paulista injured. If Shkodran Mustafi is not fit, Per Mertesacker may have to make his first start for 13 months. Wenger might have to change shape. It is far from ideal. It also affects on his decision whether to pick Hector Bellerin, a scorer against Everton last week, or Alex Oxlade-Chamberlain, Man of the Match in the semi-final win against Manchester City, at right wing-back. Both managers have insisted the opposition are favourites. Wenger is right. His side are underdogs and not just because Chelsea have won eight of their last 12 meetings. The champions are fully fit, in form, with seven straight wins, and seemingly fired up. In the midst of the title celebrations at Stamford Bridge, Eden Hazard spoke about his determination to do the Double. He and Pedro Rodriguez may present the biggest obstacles to Arsenal. 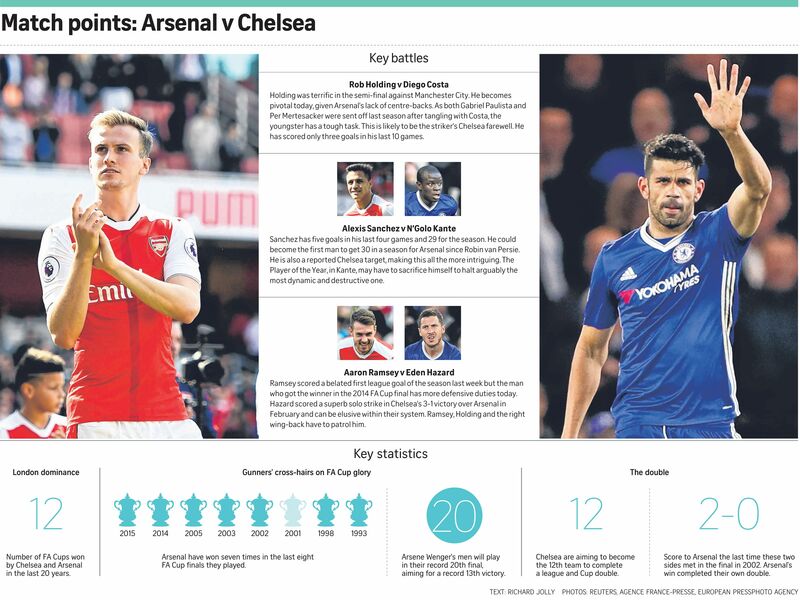 Wenger's tactical rethink has offered his back three more protection, but his strategic skills will be tested by Chelsea's roaming inside-forwards. It is probably not Wenger's last game, though he is yet to confirm if he will sign a new deal, but even if victory is not valedictory, it would be timely, and not just to quell unrest. He has already won an FA Cup final against Chelsea, in 2002, in the days when Arsenal were London's top team, not its third representatives in the table, and when they were doing a second Double in five seasons. Now Chelsea could do a second in eight, both under Italian managers. As they have knocked out Manchester United and Tottenham and Arsenal have eliminated City, whoever prevails should be deserving winners. But it should also show if Conte is not merely Wenger's opposite, but his superior.